Internal switch-mode power supply for low distortion audio with superior transient response. boosting and cutting specific frequencies to improve sound quality and clarity. for crystal clear high-frequency reproduction. Versatile trapezoidal enclosure design allows different positioning. 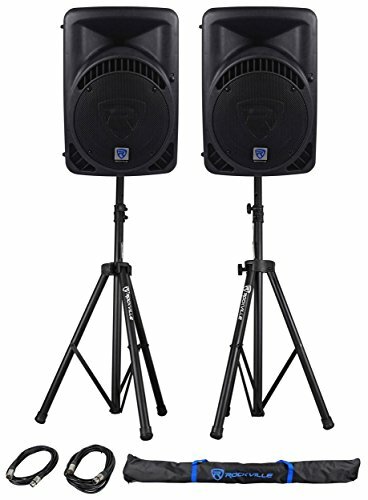 12" 800 Watt Active DJ/PA Speaker With Built In Bluetooth. 800 Watts Peak / 400 Watts Program / 200 Watts RMS. High power long-throw 12'' woofer with 2.5" aluminum voice coil. provides incredibly deep bass and acoustic power. Frequency Response: 40Hz-20KHz. Maximum SPL @1w/1m: 125dB peak / 122dB continuous. Bluetooth signal input. Now you can input any audio signal from your Bluetooth. enabled music player or phone. player functions, including volume, from the included wireless remote. digital effect is built in with lots of control capabilities. LCD screen displays MP3 functions including BT connectivity. High-power 2-way pro sound reinforcement speaker system for live sound and playback applications. Compact and light weight system delivers distortion free sound even at extreme SPL. Linear Class AB amplifier technology: high power, transparent sonic performance. Internal switch-mode power supply for low distortion audio with superior transient response. 5-Band Graphic Equalizer allows you to custom tailor your sound to your venue by boosting and cutting specific frequencies to improve sound quality and clarity. State-of-the-art 1.35'' Japanese made pure titanium-diaphragm compression driver for crystal clear high-frequency reproduction.